Pineapple-Sriracha Baked Ham | Healthy. Delicious. 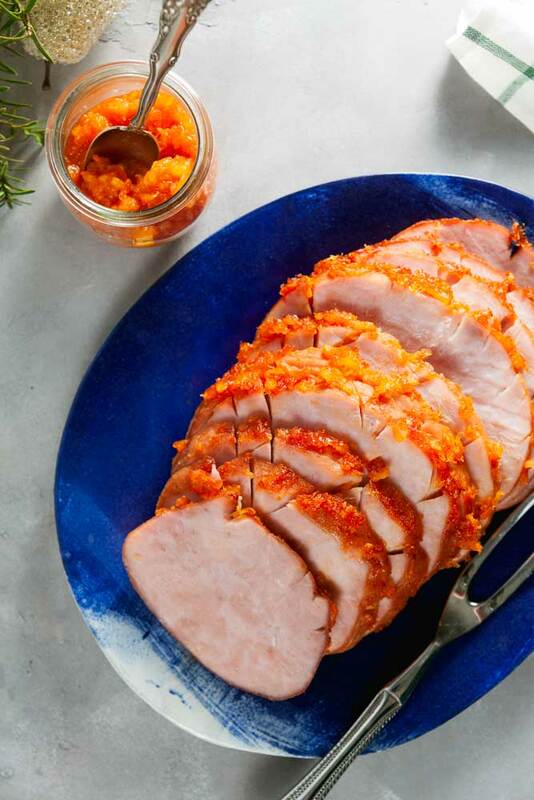 Pineapple-Sriracha Baked Ham is a delicious way to spice up your holiday! When I was a kid, I’d go to the grocery store with my mom and I remember standing at the deli counter for what seemed like hours. I spent most of that time staring at the giant ham covered with pineapple rings and cherries and wondering if maybe this would be the time the time that we might get to bring some home. I’ve always loved pineapple, and that ham looked like heaven. Of course, you never get anything if you don’t actually ask for it, so eventually I did. And it didn’t live up to my expectations at all. I was so disappointed. There was no sign of the pineapple, and the ham was limp and flavorless. I pretty much steered clear of the ham pineapple combination ever since (except on pizza). I recently decided to give the combo a second change. First, I started with a smoked ham, so I knew there would be tons of flavor. Then I covered it with a glaze made from crushed pineapple, a smidge of brown sugar to help things caramelize, and sriracha to spice it up. The sweet and spicy glaze has tons of flavor and was definitely a big hit. 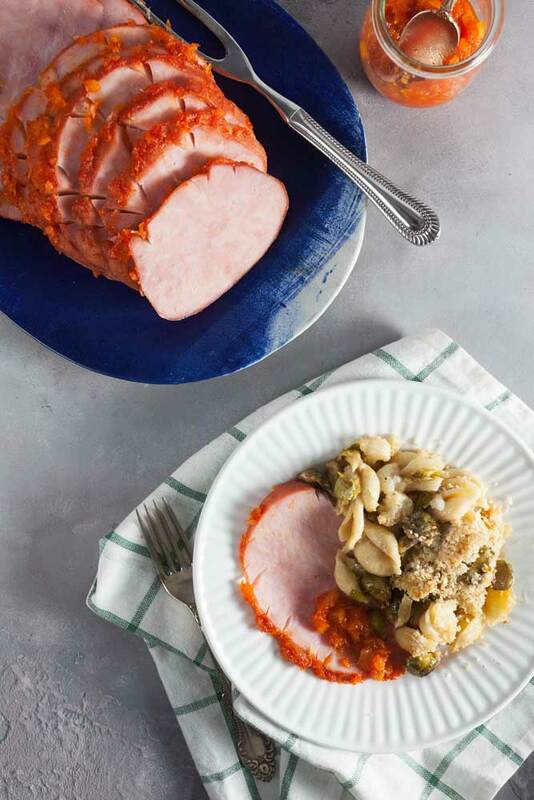 I served the pineapple-sriracha baked ham with winter vegetable mac and cheese, but it would also be great with a more tradtional mac and cheese recipe, scalloped potatoes, or mashed potatoes. 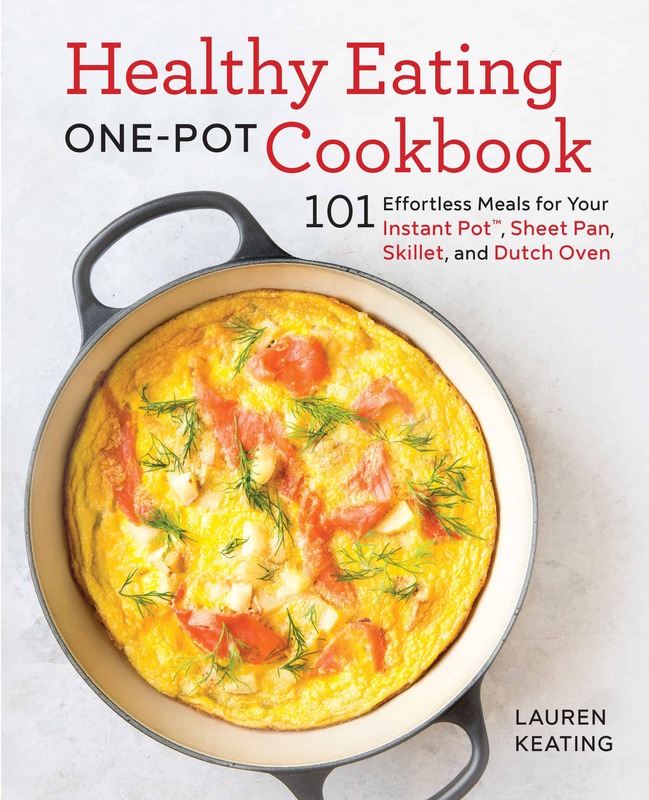 Heat your oven to 300ºF. In a saucepan set over medium heat, combine the pineapple, brown sugar, and sriracha. Cook, stirring frequently, until reduced by half – about 5 minutes. Score the ham and place it in a baking dish. Spread one third of the glaze over the ham. Bake 1 hour. Remove the ham from the oven and spread with half of the remaining glaze. Return to the oven and bake 45-60 minutes, or until warmed through. Slice thinly and serve with remaining glaze. Sweet and spicy just the way I like it! We love sriracha, and the addition of pineapple sounds like absolute perfection! This ham looks awesome and I love the flavors. Esp the pineapple. What a delicious idea…the flavors sound so good together. That sounds really good! We love spicy around here! 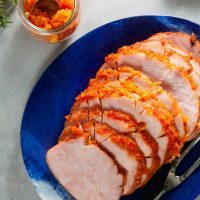 That ham is gorgeous and such a perfect flavor combo! Well this definitely sounds like it wouldn’t be limp or flavorless for sure! We love spicy over here! I love the sriracha twist! I bet the flavor is amazing! YUM! I love the sweet-spicy combination you’ve got going on here. And with the smokiness of that ham, I have a feeling it balances out perfectly. Well done! 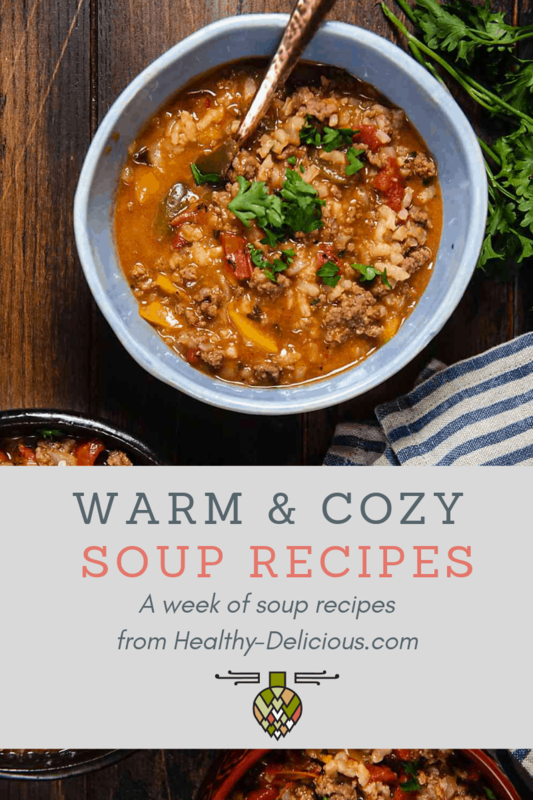 This looks so easy and these flavors are perfect! I can’t wait to try it!